Dillon Ching arrived home at Sunset Beach last year to find up to 40 people, some of them admittedly drunk, fighting on or along Kamehameha Highway with beer bottles and baseball bats flying. Witnesses described an "alcohol-fueled riot" that led to the death of a North Shore father. "It was in this fast-moving, dangerous, chaotic, adrenaline-pumping situation that out of the corner of his eye, Dustin Jimenez saw somebody approaching him," said Chester Kanai, Jimenez's lawyer, yesterday. "He reacted instinctively. He turned and fired, fearing that he would be physically harmed." Jimenez, 22, of Wahiawa, is on trial in Circuit Court for second-degree murder in the death of Ching, 30, and on other charges. Kanai told the jury that Jimenez is not guilty of murder because he fired in self-defense or while experiencing extreme emotional disturbance. Deputy Prosecutor Wayne Tashima said Jimenez challenged Ching before shooting him in the neck and chest. The fight started just before midnight May 19 when Blake Wabinga, 26, who had been drinking beer at the Ching residence, challenged one of about 20 people who were drinking beer at the beach across the street and knocked him to the ground twice. "Then a lot of guys came running up to the street, throwing bottles at me," Wabinga testified. One bottle hit him near his left eye. Others who were drinking at the Ching residence, including Wabinga's older brother, also ran out to the street. Brandon Wabinga, 29, said he swung a bat at four or five guys to prevent them from attacking him. He said he saw one of Ching's younger brothers attacked with a bat. He said everybody stopped fighting momentarily after Jimenez fired a shot from a handgun into the air. He said Jimenez then fired a second shot into the air. As the people were fighting in the street, Ching was returning home from a party with his wife and 3-year-old son, Tashima said. He said Ching's wife told her husband to help his brothers stop the fight. After the second shot, Brandon Wabinga said, Ching came up along his left side and asked him what was happening. Blake Wabinga said he yelled at Jimenez to put the gun down. Instead, he said, Jimenez pointed the gun at him, his brother and Ching and said, "You like get nuts or stupid or something?" 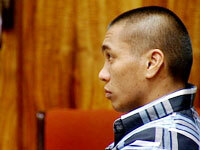 Ching's wife saw Jimenez lower the gun and yelled at her husband to watch out and get out of the way, Tashima said. As she approached her husband to try to pull him out of the way, Tashima said, she heard Jimenez say, "What, you wanna act, f--, you wanna act?" The Wabingas said they ran for cover and heard two more shots. After Ching's wife saw her husband shot, she covered his body to prevent further injury and was kicked and punched, Tashima said. An ambulance took Ching to Wahiawa General Hospital, where he was pronounced dead.